2018 was a big year for the healthcare industry in terms of technology, and we can expect even bigger things in 2019. As hospitals, clinics, and physicians work towards implementing electronic health records (EHRs) in their facilities, providers continue to look for innovative ways to enhance patient care. 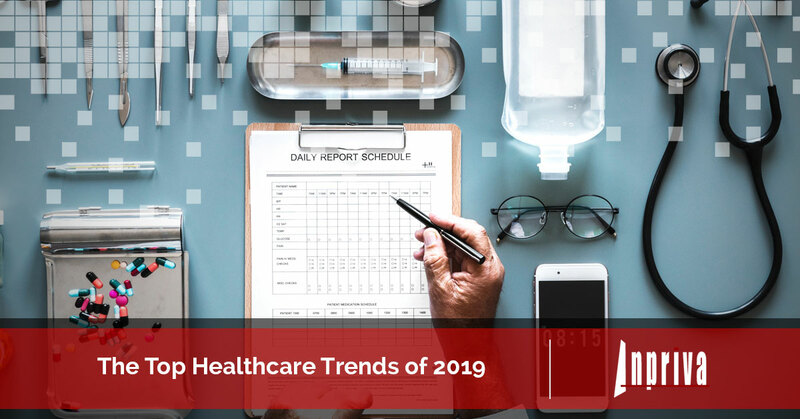 In this blog, we’re going to look at some of the top healthcare trends to look for in 2019. Electronic health records, also called EHRs, are exactly what they sound like. EHRs give healthcare professionals the ability to safely exchange patient health information electronically. Not only does this provide a better quality of care for the patient, it creates enhancements for employees within the organization as well. EHRs have become extremely popular over the past decade because they can help healthcare providers manage patient records better, while providing them with the sensitive information they need to make decisions. Let’s take a look at the advantages of EHRs below. EHRs are an effective way for providers to securely share electronic information with patients, hospitals, behavioral health facilities, and more. Many healthcare professional love EHRs because they can provide them with accurate and up-to-date information about patient health history and current care methods. EHRs have been shown to help providers more accurately diagnose patients, as well as reduce medical errors. When a medical facility utilizes an EHR, patient data is much more secure, which will lessen the risk of cyber attacks and hackers. EHRs can actually help providers improve productivity at the office. EHRs are found to improve patient and provider interaction. In 2019, you can expect to see new EHR platforms and infrastructure being created that will help to automate the clerical work that most physicians face on a daily basis. If you’re like most people, you probably don’t love going to the doctor. This causes some people to let conditions worsen because they dread medical attention, which can ultimately drive up medical costs, including visits to the emergency room. As healthcare technology continues to advance, we may see virtual healthcare take a rise in 2019. With the help of virtual technology, patients will be able to communicate directly with their caregiver, without having to step foot in the doctor’s office. 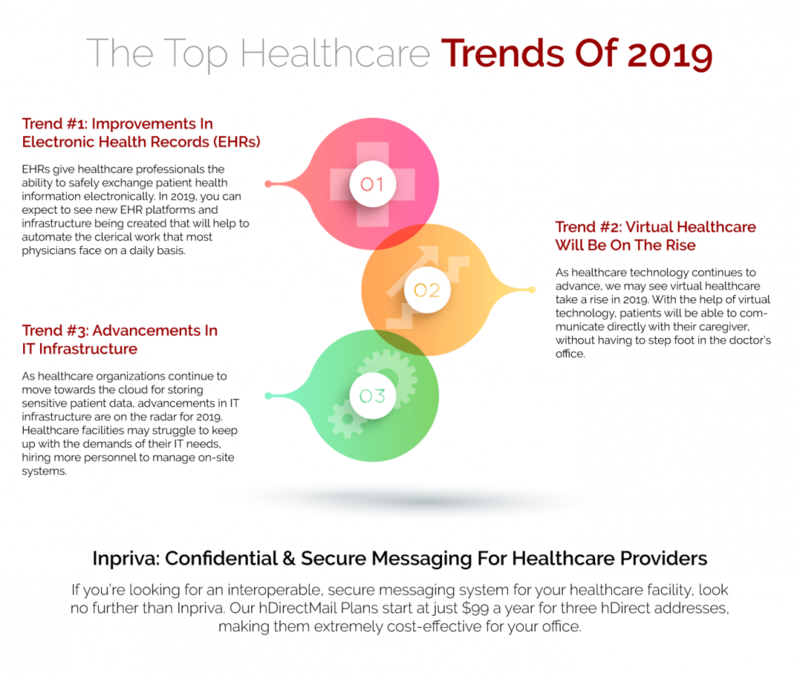 As healthcare organizations continue to move towards the cloud for storing sensitive patient data, advancements in IT infrastructure are on the radar for 2019. Healthcare facilities may struggle to keep up with the demands of their IT needs, hiring more personnel to manage on-site systems. If you’re looking for a secure messaging system for your healthcare facility, look no further than Inpriva. Our hDirectMail plans were created to support the secure collaboration between social services, judicial systems, public health services, population health monitoring, and more. When you sign up for a hDirectMail plan, you’ll be able to connect to the DirectTrust Accredited Network, where you’ll be able to find hundreds of thousands of verified Direct Addresses from other healthcare providers and clinicians.